Mothers deserve to be honored every day of the year, but today is a special day set aside to acknowledge the unique and special contributions that only moms can make. Love, nurture, sympathy, devotion, wisdom, gentleness, and discipline are just some of the many ways moms pour their hearts into the lives of their children. 1. Be yourself – Down to earth, genuine, and authentic people build trust with others. People who are comfortable in their own skin draw others to them and create an atmosphere of warmth and safety. 2. Do your best – Trustworthy people take pride in their work and exhibit a high degree of conscientiousness, a key trait that has been shown to separate high performers from average ones. Demonstrating earnestness, a strong work ethic, and diligence are all ways of doing your best. 3. Say please and thank you – Showing these simple gestures of politeness and consideration of others is a remarkably easy way to build trust. Being polite demonstrates you respect others and their contributions. 4. Treat everyone with respect – This pearl of wisdom shows you value other people. Every person has inherent worth, regardless of their socio-economic level, race, religion, etc. Showing respect communicates a level of humility about yourself that breeds trust with others. 5. Stand up for what you believe in – Whether it’s standing up to bullies or taking a stance on an unpopular issue, moms encourage us to be true to our principles. That’s what integrity means – behaving consistently with your values. A person of integrity is a trustworthy person. 6. Keep your word – The bedrock of trustworthiness is following through on your commitments. If you agree to do something, do it. If you make a mistake, admit it. If you wrong someone, apologize. Simple to say, sometimes much harder to do, but essential for trustworthiness. 7. Don’t say anything about someone you wouldn’t say to their face – Gossiping, back-stabbing, and being disloyal are quick ways to break trust with people. It takes a tremendous amount of character to be honorable to people, especially when they aren’t around. 8. Treat others the way you’d like to be treated – This rule is golden for a reason. It serves as a guiding principle for many of the axioms on this list. It conveys respect, love, consideration, honor, and generosity of spirit, all of which build trust with others. 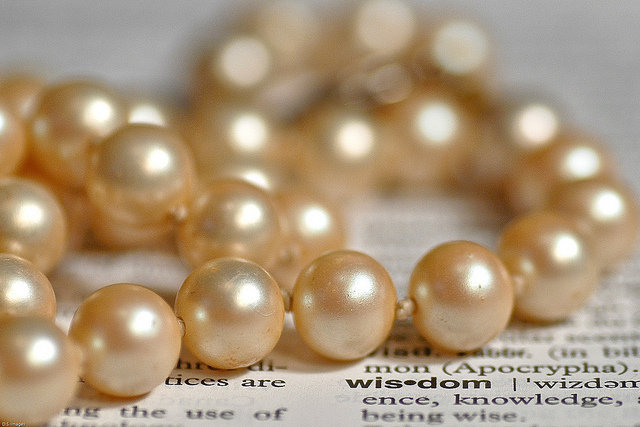 Those are just a few of the pearls of wisdom mother’s share with us that help us become trustworthy individuals. I’m curious to know what other nuggets of truth your mother has shared along these lines. Feel free to leave a comment with your input. Thanks Randy, indeed behind one’s success, there’s mom…. I interview and train the next generation of leaders. These “Pearls of Wisdom” are void in most people entering the workplace. Due to the change in family dynamics this information does not get passed on the those I speak with. I find myself going back to a very basic beginning and teaching these pearls as part of the orientation of new members of our team. A false assumption would be thinking that members of an organization have been exposed to these “Pearls”. Excellent point Tim. With divorce rates at 50% and the increased fracturing of the nuclear family, many of these pearls of wisdom aren’t being passed down through the generations. It places a greater responsibility on organizational leaders to help fill the void. Being proud of your achievements but never brag. Not taking yourself too seriously but take what you do seriously. Trying as much as possible to be a person who is comfortable to be around. Those are excellent additions Murray. It sounds as though your parents imparted a lot of wisdom to you. As always, I appreciate you sharing your insights!